Grey Cardboard There are 3 products. 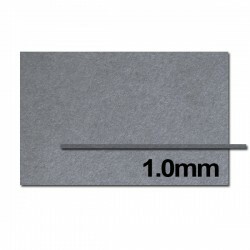 Grey Cardboard 1mm thick. Cheap! You paste easily Great for architectural models, modeling and prototypes. The laser cutting price are per linear meter. Follow the instructions to calculate the total length and cost here Select the laser cutting length to see the cost, or purchase the product only. Grey cardboard 3.0mm thick. Cheap! You paste easily Great for architectural models, modeling and prototypes. The laser cutting price are per linear meter. Follow the instructions to calculate the total length and cost here Select the laser cutting length to see the cost, or purchase the product only.